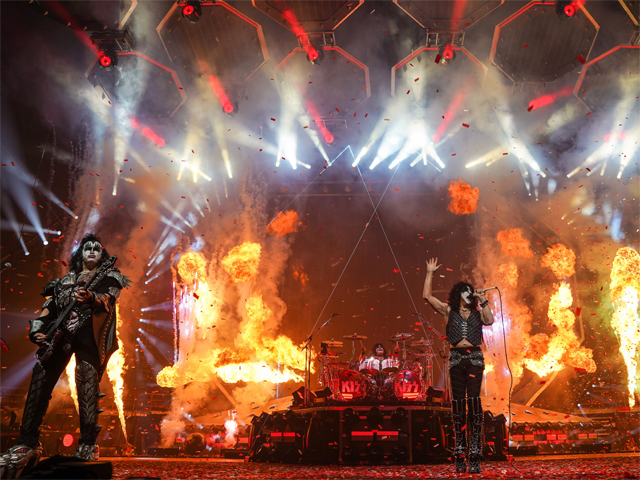 KISS delivered a massive event each night thrilling the fans and critics alike. The show was full of the band's long discography of hits with production second to none and lots of KISS' trademark pyro. The KISS Army responded in spades, with Epic Rights, KISS' concert merchandiser confirming that KISS broke the record for the most merchandise sold at their first three shows by a rock band. Paul Stanley, Gene Simmons, Tommy Thayer and Eric Singer delivered a killer set list featuring all the beloved KISS classics including 'Rock And Roll All Nite', 'I Was Made For Loving You', 'Detroit Rock City', 'Love Gun', 'Shout It Out Loud' and 'Lick It Up' that had fans salivating. "The End Of The Road" tour will continue traveling throughout 40+ North American cities before heading overseas to Europe, returning stateside in the summer and finishing the year here, saying an emotional farewell to devoted KISS Army fans as they go. Don't miss their very last Australian and New Zealand tour!